Designed to be used with the utmost ease, Detecto's model 6745 digital baby scale can weigh even the most active baby. With step-by-step instructions right on the keypad, theres never any question about what to do next. The Detecto 6745 features lock-in weight ability, built-in battery charger for NiCad or NiMH batteries (15 hours charging time), a locking pin for easily removing the tray for cleaning, and sleep and auto shutoff modes to extend battery life. Designed to be used with the utmost ease, Detecto's model 6745 digital baby scale can weigh even the most active baby. With step-by-step instructions right on the keypad, there’s never any question about what to do next. The Detecto 6745 features lock-in weight ability, built-in battery charger for NiCad or NiMH batteries (15 hours charging time), a locking pin for easily removing the tray for cleaning, and sleep and auto shutoff modes to extend battery life. 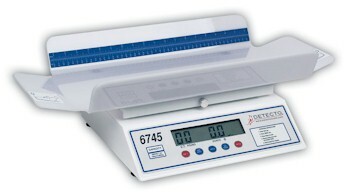 Detecto 6745 Digital Baby Scales have a lock-in weight feature which compensates for typical newborn movement. When weight stabilizes, it is “locked in" and displayed. The infant can be removed and its weight is retained. The scale features a built-in battery charger, battery or AC power, a built-in measuring tape, and a large 1.0" high transflective LCD display. Serial output allows the scale to be connected to a printer or PC.